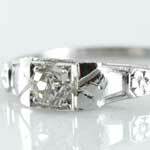 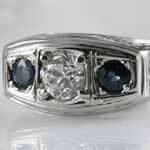 Lovely small old mine cut diamond estate engagement ring in 18kt white gold. 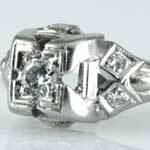 Lovely estate1/3 ct diamond two colored gold European-cut diamond engagement ring (14kt). 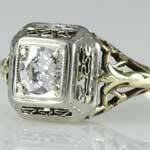 Three old European-cut diamonds beam in this estate diamond gold filigree engagement ring (0.45 ct tw,J-K,SI1-2). 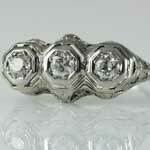 Ladies unusual big 1930s platinum 1.5 carat Old European Diamond wedding ring. 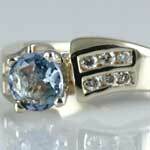 Pretty vintage round aquamarine diamond ring in 14kt yellow gold. 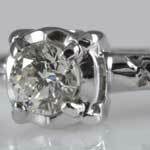 This dainty ladies engagement ring in white gold is beautiful. 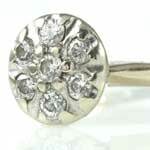 Lovely vintage diamond flower basket engagement ring in 14kt white gold. 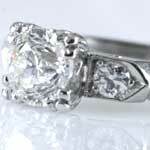 Stunning diamond solitaire engagement ring in white gold with flower engraved shoulders (0.40 ct, SI2,H). 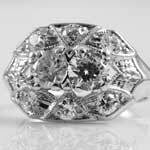 Estate ladies high quality European Cut diamond VVS2, color I, 3/4 ct diamond platinum engagement ring (0.98 ct twm VVS2-SI1, G-I). 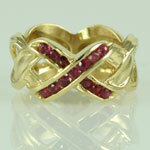 This estate designer X ring is made with rubies mounted in 18kt yellow gold. 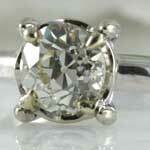 Stunning over 1 1/4 carat slightly yellow old European-cut diamond solitaire engagement ring (1.30 ct, VS1,M).